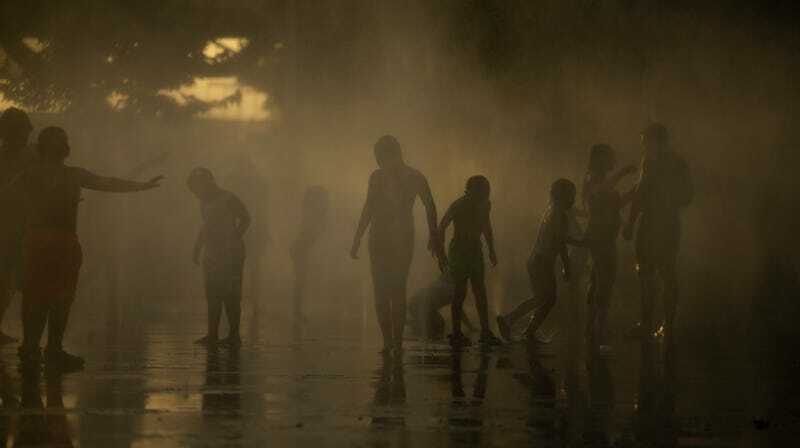 People cooling off in Madrid Rio park in Madrid during an August heat wave. Every year around this time, NASA and the National Oceanic Atmospheric Administration (NOAA) release their annual checkup on Earth’s climate. Independent climate nonprofit Berkeley Earth also puts out its annual report, as do British climate scientists from the UK’s Met Office and the University of East Anglia. It’s a convergence of climate data nerds around the world to tell the public exactly how much Earth’s sweating right now and remind us that we’re the ones cranking up the global thermostat. Last year’s report, published January 18, revealed that 2017 was the second warmest year on record. That report came on the heels of three back-to-back warmest years on record, from 2014-16. Robert Rohde, lead scientist at Berkeley Earth, told Earther his organization has “indirect dependencies” on the NOAA and NASA datasets. He said that while some automatic data collection is still happening, other manually curated products aren’t being updated, and lots of tools for data access and analysis are offline at the moment. “We’ve been able to access some but not all of what we need,” Rohde said. Same goes for the UK Met Office, which also relies on NOAA data, according to reporting by the New York Times. So, nobody’s putting out a 2018 climate report just yet. Rohde characterized the report’s postponement as “mostly a nuisance” rather than a serious problem. But it’s symptomatic of the many ways in which the government shutdown continues to hamstring science, be it by preventing researchers from attending conferences or stalling funds for long-term research and monitoring projects. Bob Ellis, a marine ecologist at the Florida Fish & Wildlife Research Institute in St. Petersburg, Florida, is one of the researchers feeling the stall. He told Earther he’s been waiting to hear from NOAA on whether it’ll extend funds for an acoustic array that tracks the Goliath grouper, a federally protected species of fish living along the state’s southwest coast. The funding decision, which will impact the upcoming field season, was supposed to come in early January, but so far it’s been radio silence. “If array extension [is] not funded we can find other fish to tag, but still a frustrating and stressful time,” Ellis told Earther via Twitter DM. Countless other scientists have similarly had their research thrown into disarray. Another long-term impact Signh is particularly conscious of is how the suspension of government research, as well as the availability of data and online resources, will affect the scientists of the future.